Hooray! Finally something cool has been found in my own backyard. A cannon dated back to approximately 1750 was found on the corner of Orange Street while workers were digging in order to install an electrical cable. Chairman of the Cannon Association of South Africa, Gerry de Vries, has said that it is most likely a Swedish cast gun. Historically there is no evidence of cannons in this area of the Cape, but de Vries states that the cannon was most likely used as a bollard to stop those crazy ox wagon drivers from cutting corners. 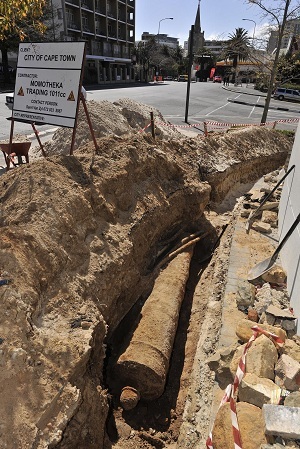 Check out the full story here: Cannon dug up in City Central.